HANDY PORTABLE BLENDER - The blender comes with a traveling lid and a blade lid, so we could juice on the road. The bottle you can carry around, which is easy to grab. Its ideal for home, office or travel since it is so portable. SINGLE SERVE JUICE BLENDER - A 600ML(20oz) bottle, it’s the perfect size for making individual shakes, smoothies or protein drinks, yet it’s small and light weight enough to be very portable. Small enough to store anywhere. DURABLE TRITAN JAR - Tritan BPA-FREE mixer jar be certified by FDA, resists high-temperature up to 228.2°F, healthy and durable. And this has wide opening, getting your favorite ingredients into to the bottle without a problem. POWERFUL MOTOR AND 4 STAINLESS STEEL BLADES - 300 watt powerful compact motor is perfect for a variety of frozen fruit, vegetables, pulverize ice and shakes. Equipped with 4 stainless steel blades, blender is more efficient to mix food. EASY TO USE & CLEAN - This blender has simple one touch operation, super for breakfast or making a fast drink. Dishwasher safe, removable lid is easy to clean, just to run water over it. You’re covered for 2 full years quality warranty. 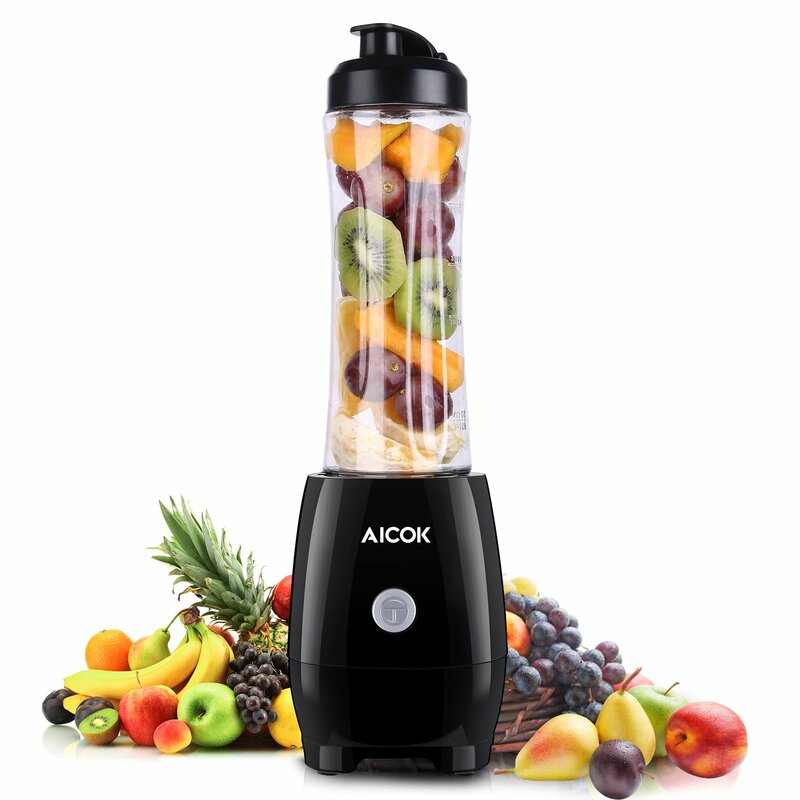 Aicok Personal Blender with Travel Take-Along Sport Bottle, perfect for homemade, office, travel and outdoor sport. You can use this personal smoothie maker for shakes and smoothies, it provides a simple way to get the nutrients you need every day. ☛The One-Touch action means you just place the bottle on to the base, twist to lock and then press the button to blend your drink. Making blending fast and simple, the blender is ideal for the healthy conscious to make homemade spots nutrition and protein shakes. ☛Hold the “ON” button 2-3 seconds at the beginning, after 2-3 times repetition we could long-press on the ON button for ultimate treat. The Aicok drink bottle be made of Tritan, it’s BPA-FREE other than PC plastic. Take your juice bottle to work or gym, or keep it with you in your home. It’s ideal for you enjoy great-tasting, healthy drinks. 1.Add the ingredients into the bottle, then screw the bottle with blade lid. 2.Place the jar on the blender base. 3.Twist the bottle slightly and tightly to start blending. 4.Unscrew the blade cap lid, replace with the easy to drink lid cap.